The turn of the calendar to the new year is a good time to reflect on the previous year to see how things change. 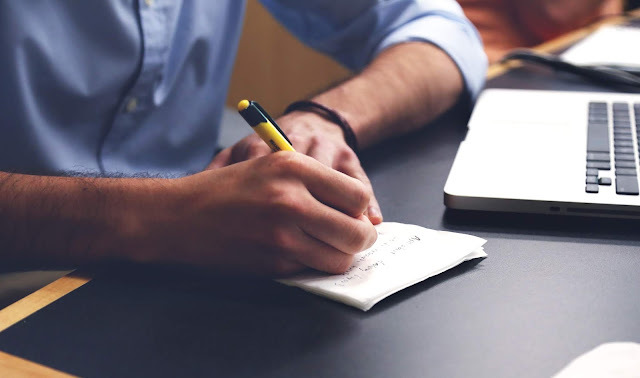 I take the time to look back on the year that was to see how my dividend growth portfolio performed. Not from a return perspective; rather from a purely dividend growth perspective. Since my goal is to build up a portfolio of excellent companies that pay me cold, hard cash in the form of dividends, to support our lifestyle it's the dividends that are the most important part of the portfolio with capital appreciation taking the backseat. The thing is dividends are much more steady and predictable than capital appreciation for any given year. Most of the companies I own increased their dividend at some point during 2018; however, the manic/depressive Mr. Market changed his tune multiple times throughout the year. My forward dividends for the companies owned in my FI Portfolio ended 2018 at $6,250.78. 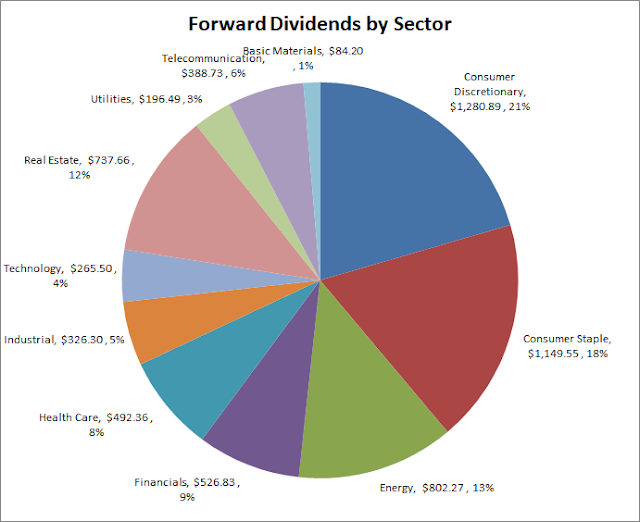 The following chart shows the breakdown of my forward dividends by their primary sector. By sector the 2 largest contributors are consumer discretionary and consumer staples at 21% and 18%. I'd like to get my consumer staples exposure a bit higher; however, I'm in no rush to do so if the valuation doesn't make sense. Energy is the next largest sector and is forecast to provide 13% of my dividends currently. During 2017's check up I discussed wanting to reduce my weighting there to the 8-10% range and well, it stayed the exact same as last year. Looking at the rest of the weightings there isn't anything that really stands out as needing to be addressed other than health care and possibly the industrials. My target for both would be somewhere closer to the 8-10% range. Industrials were previously weighted closer to that until I closed out my position in Emerson Electric (EMR) in December. Utilities could probably also stand to be boosted up to somewhere in the 5-8% range. The $50 Club increased by 3 compared to the end of 2017 and now sits at 38 members. Sixteen of those holdings are currently stuck in the $50 Club until further notice. The $100 Club lost 1 member over the year as I did some cleaning up of the portfolio in late 2018. Eleven of the $100 Club members max out in the $100 level. The $200 Club grew by 1 member with PepsiCo (PEP) joining the ranks thanks to a monster dividend increase last year. The $300 Club is still just a party of 2 between McDonald's (MCD) and Target (TGT). Chevron (CVX), Phillips Morris (PM) and Johnson & Johnson (JNJ) are all within $20 of pushing the $300 Club up to 5 members and within reach of crossing that plateau in 2019. My forward dividends are very heavily weighted towards the top 10 or so holdings. I'm comfortable with those weightings considering the quality of the companies included. The only one that is a bit more speculative would be Omega Healthcare Investors (OHI) and all future dividends will be taken as cash. 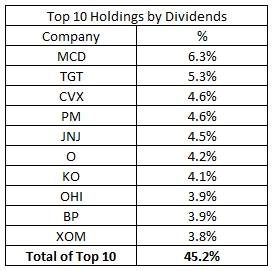 The top 10 holdings, by percentage of forward dividends, are listed below. At the end of 2018 I owned 51 different companies within my FI Portfolio. Of those 51 companies, 46 of them gave me pay raises throughout the year by either increasing or initiating a dividend payment. There were 4 companies that I did not receive a dividend increase from in 2018. While that might sound like a lot, 2 of those were due to positions being initiated after the increase for 2018 was already announced. Those 2 companies were Digital Realty Trust (DLR) and US Bancorp (USB) although they announced raises of 8.6% and 23.3%, respectively, prior to my purchase. That leaves 2 holdouts that didn't announce raises during the year. One is Sabra Health Care REIT (SBRA) which I received shares via the Care Capital Properties (CCP) merger which I had previously received shares via the Ventas (VTR) spinoff. The position is small at just 5 shares and the yield currently sits around 9.6% so I'm just taking the dividends in cash and letting that position ride. The other position is General Mills (GIS) which has run into growth issues for the business. The dividend has now been the same for 7 straight payouts although I'm not too concerned about the safety of the dividend just yet. Although a deeper dive into the business seems warranted. All I can say is that I didn't learn my lesson from 2017. In December 2017 General Electric (GE) announced a 50% cut to their dividend payment citing a cash crunch but insuring investors that this was ample to get the business through the tight spot. I didn't listen then and fast forward to December 2018 and management gave owners another crappy Christmas present announcing a reduction of the dividend all the way down to $0.01. In December I decided to trim my position by roughly 40%, way too late I know, just to not have to deal with it any more. The remaining 100 shares I will be selling call options against in the hopes of making up some of the lost capital and also serve as a bit of a lotto ticket should the ship get righted. For the portfolio as a whole there were 57 increases announced from 46 of the companies that were held in the portfolio. As I mentioned earlier I did some spring winter cleaning for my portfolio in December and closed out some of my positions. Last year got started off with a bang after the corporate tax cuts officially took place and spurred plenty of dividend increase announcements. January and February were the most active months with 8 and 7 increases, respectively, while November was a bit of a slog with only 2 raises announced. I expect my lower yielding companies to be among the fastest growers while my higher yielders should be among the slower growers. As you can see in the following chart that trend generally holds. The average growth rate for 2018 came in at 9.41% while the median growth rate came in at 8.01%. Of course I'm more interested in the weighted growth rate as it gives the cleanest idea of organic dividend growth for my portfolio. 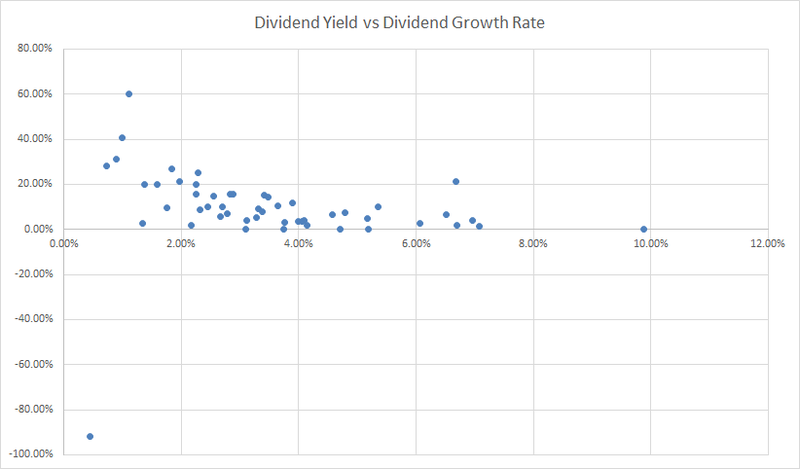 Since each company carries a different weight in terms of dividends you can't take just the average of each company's dividend growth to come up with a dividend growth for the portfolio as a whole. 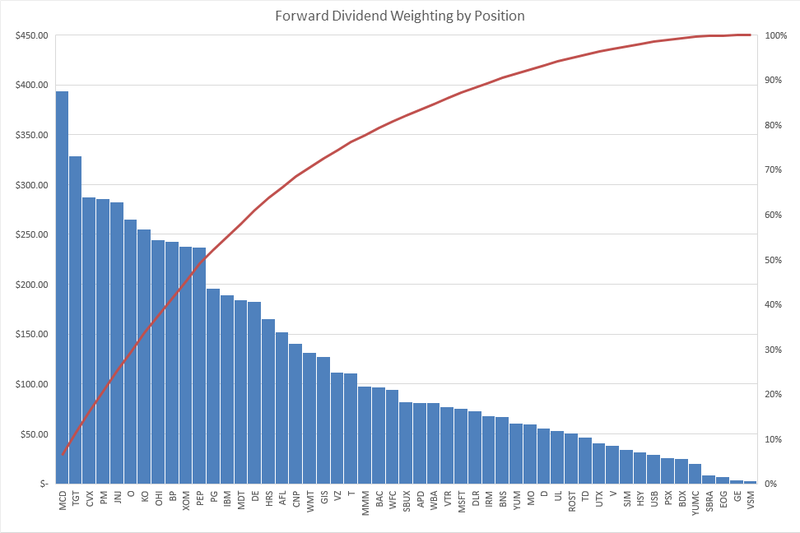 Rather you have to assign a dividend weighting to each positions' dividend growth and sum it up. The formula would look like this Dividend Growth for Position 1 * (Dividends for Position 1 / Total Dividends for Portfolio. Do that for each position and add it all up and you get the weighted dividend growth for your portfolio. The weighted dividend growth rate for my FI Portfolio for 2018 came to...drumroll...8.76%. Not a barn burner by any means but a nice step up from the 4.65% weighted growth rate for 2017. Keep in mind that includes the 0% contributions from US Bancorp, , Digital Realty, Sabra and General Mills as well as the negative growth from General Electric. Excluding those pushes the portfolio's weighted dividend growth rate up to 9.25%. Overall I'm very happy with how 2018 went. The majority of my positions gave dividend increases with only 3 real laggards announcing cuts or failing to announce a raise. A weighted dividend growth rate of 8.76% for the portfolio as a whole is a more than adequate pace of growth especially with the current yield on my entire portfolio hovering just over 3.0%. 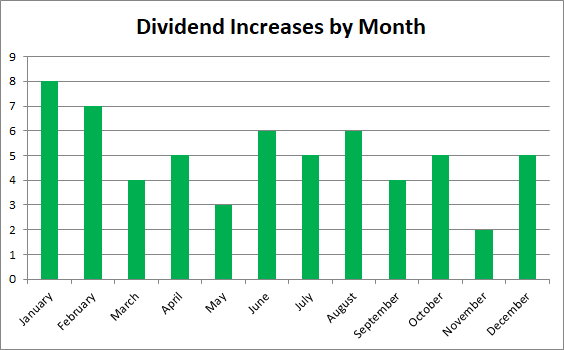 In 2018 I was also able to cross off a few milestones with 2 months, September and December, bringing in over $1,000 per month in dividends. I also received nearly $6,300 of dividends from my holdings which works out to roughly $525 of extra monthly income. Looking forward to 2019 I'd like to bump up my health care, industrials and consumer staples weightings and potentially my utilities as well. Of course the primary focus is going to be on the valuation at the time of purchase. The other main goal is to use whatever new capital, as well as cash dividends, to build up my positions rather than building out the portfolio. How did your portfolio's dividend growth turn out for 2018? Better or worse than expected? Were you caught off guard by any dividend cuts or unexpected freezes?